The Yankees didn't even get five innings out of their starter last night but still won. How? It's no secret: their bullpen has been untouchable. No Mariano? No problem. David Robertson put an end to that discussion quickly, but then left for the White Sox and more money. This year's dynamic duo is Dellin Betances & Andrew Miller, who've combined for 18.2 scoreless innings in 17 appearances. Betances had a "slow" start but has really looked sharp in his last few outings, and Miller has been as filthy as advertised. Esmil Rogers also deserves a shoutout as the go-to long reliever with a 2.84 ERA in 12.2 innings. After last night's W, the Yankees sit atop the AL East tied with the Rays at 11-8. It turns out the Yankees aren't the only team benefiting from their bullpen. 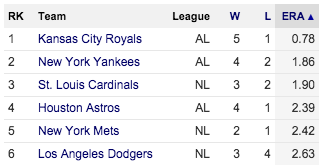 Sorted by bullpen ERA, the top six ranked teams also lead their division, except for the Royals who are a half game behind the Tigers. But the Tigers are pretty to explain. First, their offense has been explosive in 2015 – I still can't get over how Miguel Cabrera has a .652 AVG against the Indians this year (15-for-23). The Tigers also lead the majors in innings pitched by starters, so they haven't had to rely on their 26th-ranked bullpen as much to win games. For a bit of context, six of last year's 10 playoff teams had a bullpen ERA in the top 10, including the World Series champion Giants. Fifty years ago, bullpens were barely even a thing.